London. : Her Majesty's Stationery Office. HMSO. 330 x 200 mm (13 x 8 inches) - 33pp, 15pp, 53pp, 46pp. Ex Reference Library (Newcastle Upon Tyne). Library rebind. Otherwise VG - in very good condition. Published 1896-1899. Five Reports bound as one. 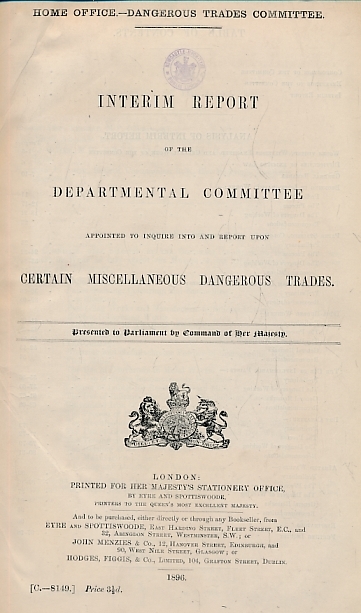 Trades detailed as dangerous include working with metals, lead, dry cleaning, paper staining, steam locomotives in factories etc.